I like cooking. But when I was coming back from shopping, I got lost and ended up being the cook of a mercenary unit. I don’t know why this happened but in order to survive, I will make delicious meals… This is the story of the heroic unit which became a legend in the future and the amazing cook who continued to support them. A nice novel about a cook, not really about the cooking, but it has that too. Give it a try, it'll make you smile, laugh and maybe even cry. The writing style is almost like a slice of life but the duality of the storytelling style that's rare makes the story meaningful. Pretty easy to be touched by the story if you're emotional. It's nothing grand and straightforward, but it's painting something mundane as significant. The author also expanded his writing style from volume to volume. The story could've ended with the first volume, and it was written that way. The subsequent volumes are written well too but the first volume still has the most impact. Reviewed at 37, rated 5. Ryouriban takes on a very distinctive plot. Transported to another world, the MC doesn’t automatically got cheat skill and has to actually uses his skills and knowledges to survive; furthermore, his main skill is cooking. It got the taste of those shounen cooking manga, but served in another world platter. The other world build was pretty good too. Additionally, the protagonist is a bit unusual. His strong dedication and lack of ambition may be cliche among Japanese protags, but the author cleverly handed him the placement as... more>> heroes’ sidekick with no extraordinary power except for the culinary knowledges he brought from his original world. He’s also assertive at times and no pushover, although he isn’t hot-headed either; a surprisingly normal adult is what comes to mind, but because his surrounding is... well, commonly abnormal, he couldn’t help but stood out at times. TL; DR, if you’re looking for unusual plot, non-MC MC, hard-working protagonist, or... food, this one will probably suit your need. This is a story about a MC who appears in an unknown world and decides to use his cooking skills to better the people he meets. You can feel the high potential of that setup. I want to see the group fight fiercely, I want to see the different places they visit and how his cooking will help them (besides magics plot armor cooking) and so on. I had high hopes for this story, and some of my hopes is in there, however but it falls shorts for a few reasons. 1. First, is the format the author chose. All chapters come in pairs (or more). The first chapter of the pair is always the MC doing his thing: cooking, requesting tools, helping built them and misunderstanding his interactions with the other party. The second chapter (and sometimes third ore more) is from that other party's point of view. Meaning the author always re-hash the same thing at least twice. And that re hash is always the other party swooning over the MCs awesomeness in a very cheesy way. This is an interesting story telling mechanic when it is used sparsely. But when it is constantly used, I find that it makes the story telling very rigid and predictable. There are things you can't do if the story has to be contained in one chapter, since the next chapter will rehash what just happened. It also makes reading tedious. You also always know, if the MC speaks to one character, the next chapter will be that character's POV. 2. Everything is too easy and cheesy. There is no tension, no suspens, any small conflict is resolved very fast. As another reviewer said, the author makes an extra effort to bend the world around the MC so that everything goes well for him. You will see girls basically fall in love in their n=first notable interaction in the novel, the MC will of course misunderstand that girl's reaction as coldness, indifference and so on, just for good measure. This is purely a slice of life novel, but this in itself isn't a bad thing, I actually love those LNs and probably more than half my reading list is made up of those. But the tediousness of the format chosen by the author, the cheesiness of the interactions and the overall low enjoyability of the story of the novel spoils all of that. Many people give this novel 5 stars. I frankly do not understand and can only deduce that it is probably just a light novel that can't be enjoyed by everyone. Good read and clever way of using multiple perspectives but sadly as of august 2017 the translator dropped it. So if there are those who are interested in translating it, that would be much appreciated. This novel may seem really generic, but it's --- I'm gonna say it -- enjoyable. I wouldn't read this if you want something exciting and blood-thirsty. It has a very slice of life feeling. The MC isn't exactly the bomb-diggity. His personality is typical for this genre, but it fits because he isn't supposed to be the main builder of the mercenaries. Despite this, he is an interesting person who continues to amaze people around him. One of the few cooking-ccentric translated JP novels around, and it's very much a slice-of-life with action and politics peppered in (see what I did there?). A good novel if you're looking for an easy-to-read story during lunch breaks. Also, the translators (konobuta) doesn't just translate each chapter, they also add images of the featured dish for a bit of context and flair. Small touches like these should really be appreciated more, especially since they are doing this more for fun and are not paid. I like reading about transmigration. I like reading about cooking. I like reading about capable protagonists. This story has all of the ingredients above, but I feel like it's a little lack luster. Skip to last paragraph for TLDR. As an example, the first chapter's dish theme is Cream Stew. Well, the ambience of the story is basically that. Very light, not much action or problems going on. The MC, Shuri, just knows how to cook, and solves the corp's problems by consoling them through his dishes. I guess I'm a... more>> little disappointed since I came into this hoping that the flavors would be deeper and more savory, with a protagonist that wasn't just a cookie cutter Japanese. Something that I didn't care for is the author's writing style. It's not bad, just doesn't suit my taste. The first half is Shuri's POV, then another person's on the same event for the second half of the chapter (the translator splits each half into 2 chapters). I actually kinda like that, but it get's tedious after a while just like having stew everyday. And the author serves up the same dish, everyday. At the end of a chapter, the author let's us know of what happens to the character's future thanks to the dish Shuri served him. The MC suddenly finds himself in another world, tied by a rope, with soldiers contemplating on whether or not to kill him. He doesn't panic, he laughs instead and asks if he could cook since he's hungry. Now. That's kinda weird isn't it? Though his response could be attributed to not realizing that the current situation was not a dream. But the author doesn't really tell us that he hasn't accepted his situation, rather he seems to immediately transition with ease. That's unrealistic point number 1. The leader of the mercenary corp let's this stranger who wears clothes from unknown origins and appeared suddenly from unknown origins, cook their food and is the first to taste it, not afraid that it might be poisoned. His vast amount of experience let's him able to judge a person just based on appearance, after all. After tasting the stew once, his stomach gets stolen and immediately recruits him without asking anymore questions about his past and puts his trust fully into the mysterious young man. Unrealistic point number 2. This story is very beautiful, Its about how a cook in a mercenary team, can change the and influence not only the decision but also the fate of the entire mercenary team. Its a light story and easy to read, no need to much thinking to enjoy the story and you can just digest the story as it is, as its not focus much on the fighting, killing, wars or politics. 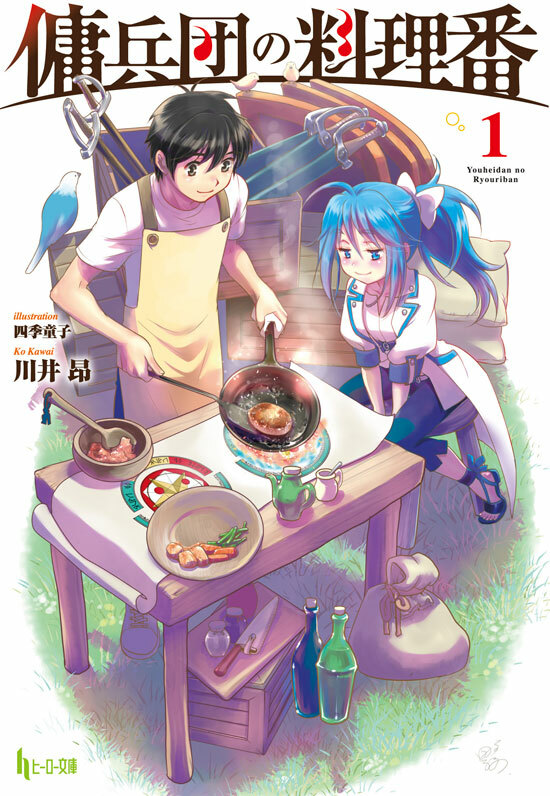 A simple story about a cook's daily life at first glance, but I really like the way that the author writes from other point of views how something small that the MC did would actually influence others people and generations to come. The story is really good. It chronicles how a great empire was united because of one man who used his cooking prowess to support his comrades. It can get confusing at times because some parts of the story are told from the different characters’ perspectives on that event. It’s an enjoyable read which can sometimes make you go “awwww, Shuri is well loved by them”. I liked this one. Each story (roughly 2-4 chapters) has 2 PoVs: the cook (Shuri) and the person he is cooking for. The difference in their thoughts on what's going on is quite interesting. Give it a try, it's a slice-of-life-like story. Literally taught me how to cook, or at least the recipes the translator linked in each chapter taught me how to cook. A good story about a dude who cooks for a hobby somehow stumbles into another world. I say hobby, but it's more like an obsession. This gimmick starts with food. His food gives people motivation to be better than what they currently are, and you know what? I enjoyed it. Each chapter is a different point of view and honestly just reading the descriptions of the food from the... more>> perspective of others made my mouth water. It's a rare story with so much juice that will leave you hungry for more. This novel is something you would want to read if you are tired of the action and life changing situations other MC undergo when transported to another world. It is a slice-of-life novel where all the MC does is cooking... and cooking... and cooking ^-^;;; I did enjoy reading the novel though, it is shown through different perspective with the same scene to show the reactions and influences the MC's food has on the others in the mercenary corp. Without knowing it, his cooking changes others perception of him and is... more>> able to help others in their troubles.